As educators, we all know the importance of building positive relationships with and among our students. We also know, however, that creating great relationships in our classrooms can be challenging, especially when we have limited time and resources. That’s where these quick relationship building activities come in! In this post, I have created a list of 8 relationship building activities that can easily fit into your busy schedule, will help you connect with your kiddos, and will help your students bond with one another. These relationship building activities are super quick, so they can fit into any short gaps you have during the day. Each one takes 5 minutes or less and requires no prep. If you’re a teacher, you have probably have heard of “turn and talk”, a strategy where students turn to each other and answer a question or discuss a topic. Usually, “turn and talk” is used in an academic context. However, you can use it in a non-academic way to boost relationships in your classroom! To do so, all you have to do is ask a non-academic question, such as “What is your favorite color?”. Then, students can turn to a partner and answer! This is an easy way to get your kids sharing with each other and takes very little time. For this activity, each student can choose to give you a hug, a high five, or a handshake. This is used most commonly as students are arriving for the day or leaving at the end of the day, but it could be used at any time. For example, as students are leaving for specials, at the beginning of recess, before students go into the cafeteria for lunch, at the beginning of each small group, or any other time you want a quick dose of connection with your kids. What was the best thing you learned today? What is one kind thing you did for someone today? What do you hope to learn about tomorrow? What was the best thing you did during specials today? These relationship building activities take slightly more time, but are still relatively quick. Use these whenever you need a boost to your student relationships, but only have a small chunk of time. One at a time, students step forward and say a fact about themselves (e.g. I have one sister.). If that statement is true for other students, they come forward one step and say “just like me”! The next student steps forward and says his or her fact. Continue until all students have had a chance to go (and you could keep going, if you have time). Go around the circle and give every student the opportunity to answer the question while the rest of the class listens. Optional: If you want, you could give the other students a chance to make a comment or ask a question after each student shares. These relationship building activities take a bit longer, usually about 30 minutes. If you feel your relationships with your students need a major dose of positivity, try these activities. Each week, draw a student’s name (or more than one, if you want). I recommend writing each student’s name on a popsicle stick and putting the sticks in a cup/jar/etc (which you can also use to call on random students to answer questions during class). The chosen student is a mystery to the class – only you know who it is! Throughout the week, you observe the mystery student’s behavior. If the mystery student had positive behavior the whole week, then he or she gets to have lunch bunch on Friday! You can also let the student (or students) choose friends to join them for lunch bunch. Not only does this motivate students to behave during the week, but it also gives you a chance to bond with the students who earn lunch bunch. I call that a win-win situation! This activity gives students the opportunity to learn about one another and play a game at the same time! During this game, students roll to move on a game board while answering questions about themselves. 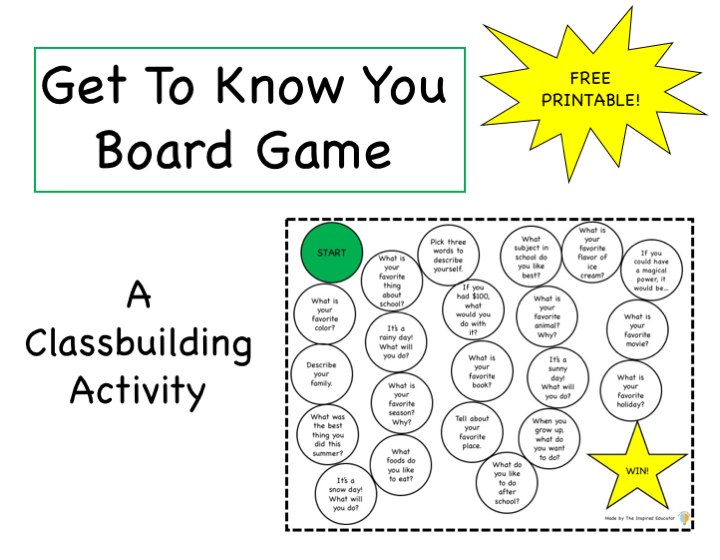 To learn more about how to play and download a free game board, read this post. These All About Me Initials are a great way to have students share more about themselves in a fun way. To do this activity, give each students a letter for each initial (so I would get a V and an S, because my name is Victoria Skinner). Then, students can write or draw about themselves in those letters. You can either give students specific things to write/draw (such as their favorites foods, their family, what they like to do, etc.) or leave it open-ended. After students complete their initials, you can hang them up in the classroom or the hallway! All of these relationship building activities will help you build a positive classroom community. I hope you found something useful for you and your students to use! If you need some reminders, get this cheat sheet to help you out. Do you have any other great ways to build relationships in the classroom? If so, send me an email or leave a comment below!